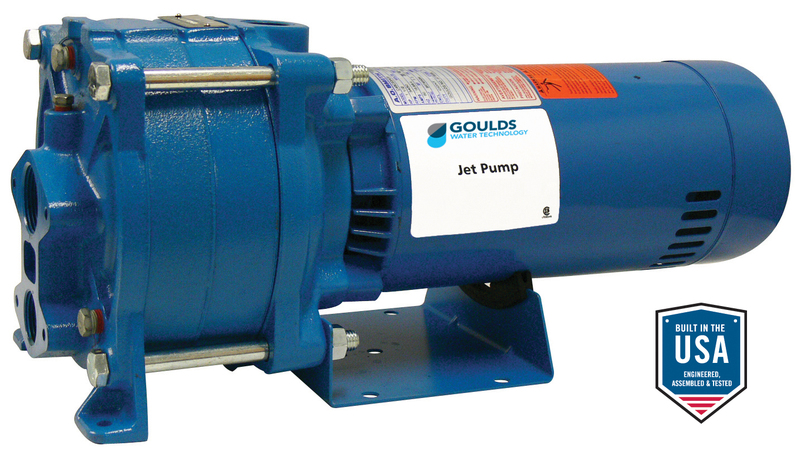 Basic Pump Unit: Includes pump, motor, pressure switch, tubing, fittings, pressure gauge and bushing. Shallow Well Package: Includes adapter, nozzle, venturi, bolts, gasket and pipe plugs. Deep Well Jet Assembly Package: Twin Pipe includes: jet body, nozzle, venturi and foot valve. Packer includes: jet body with built-in check valve, nozzle and venturi. High Capacity and Pressure: Specifically designed to deliver high capacities at greater pressures. Corrosion Resistant: Glass filled thermoplastic impellers. Stainless steel wear rings and coverplates. Electro-coat paint process applied inside and out and then baked on. Convertible: Designed for use on shallow or deep well applications using appropriate Goulds Water Technology Pumps fittings. See the performance charts on the following pages for fitting order numbers.